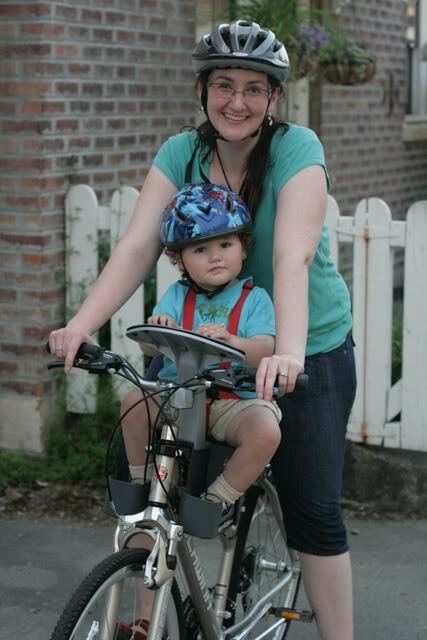 I've posted a(n unsolicited) review of the WeeRide bike seat at Hobo Mama Reviews if you want a great option for biking with your baby or toddler. it will let you pick your WW picture that's already online. Easy peasy! or a combination, like "Lauren @ Hobo Mama — My Wordless Wednesday title." 1. Link up your Wordless Wednesday posts here! 13. Melodie @ Breastfeeding Moms Unite! I don't even own a bike anymore, but am thinking that Dumb Dad and I should get them for Christmas. Gonna have to check out your review and see what age these go up to, I need one for my son because he's not quite bike ready yet, especially not in our hilly neighborhood. Thanks for sharing. great perception! Your little biker is so cute. LOL Is that a new form of punishment? Thanks for the linky and thanks for linking up with me! Oh wow! I've got to tell you, I was NOT expecting the post to end like that. First, it came to mind that you'd show us the right way, then have a picture of your neighbor doing it the wrong way (my neighbor HOLDS his baby WITHOUT a helmet, scary stuff). Nevertheless, you sweet child is SOOOO trying to be like Momma! Thanks for the review! I would love something like this, but my littlest little is almost at the weight limit. I have been toying with the idea of a bike and trailer set-up but they are SO EXPENSIVE. I hadn't even thought of Craigslist. There are some great deals on my local one. Thanks, mama! What a great looking baby/toddler seat! 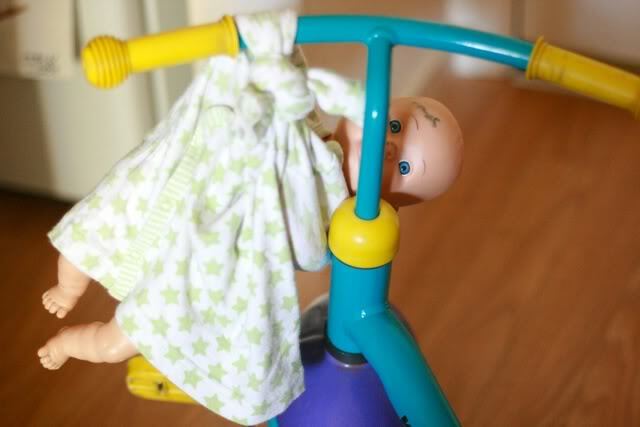 The other baby biking apparatus is a bit questionable, but undeniably hilarious! lol Great photos Hobo Mama. Thanks for stopping by and linking your WW post up on my linky. Have a great day! I've seen baby dolls being driven around my house like that, too! Too cute and too funny! Happy WW! So funny! I really need to get a seat for my bike for my little boy. I just know he won't keep a helmet on, he's anti-hat! baby doll pic- funny! Happy WW! Oh my goodness! That is hilarious. Too awesome! That seat looks really cool too! Best one I've seen! we're about to go bike riding right now with our weeride kangaroo seat! Great pics. The 2nd one is too funny. Thanks, everyone! I love how the babydoll's eyes are widened in fright. Ok, that's me anthropomorphizing. :) I was so glad I got this picture when I did, because minutes later Mikko came back and took his baby off the handlebars to go somewhere else adventurous. Megan: I know, about the expense! Glad you've been able to track down some good deals on Craigslist! Pamela: Mikko can definitely be anti-helmet, so I'll share a couple tricks we tried. I know you weren't asking for advice, but in case it helps anyone with this common problem! 1. Make it a rule that the bike doesn't go if the helmet isn't on, just as the car doesn't go if we're not buckled in. Not in a mean way, but be consistent. 2. Let him pick out his own helmet, and show him how you wear one, too. Make it "special bike-riding equipment" vs. a hat. 3. Make sure the helmet fits comfortably, and be cautious not to pinch his little neck when buckling it on. Did that, and there was fear every time after that! Sigh. 4. I never followed through on this, but I thought talking to the actual police might help if you could find a friendly officer. Get some backup, if you see what I mean, that helmets are the law because they help keep you safe. It could also be a firefighter or EMT or doctor, I suppose; I thought police because they're always patrolling our stretch of beach where we ride. I wouldn't want a little kid to be scared by the encounter, but if I could find someone who would just agree out loud with me that helmets are required (and not tell horror stories of brain injuries! ), it might sink in with him more than if just Mama says it, you know? I wish I had one of those! I miss biking. Thats too funny (the second pic). That bike seat is cool. Ive never seen one like that before. Now I am off to read the bike seat review, as I am currently saving my pennies for a bike of my own.